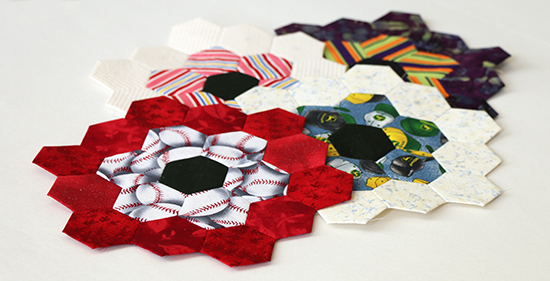 It’s time for my monthly update on my English paper piecing hexagon flower blocks. I'm still maintaining a pace of one block per week. I’ve learned that it takes me about 45 minutes to baste each of the 19 hexies, then 75 minutes to stitch them together into a block. 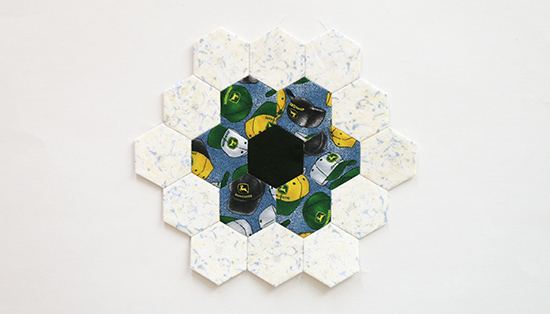 Let’s not forget the time it takes to choose the colors, and to decide the orientation of each piece within the block. I’m easily spending more than two hours on each block at this stage. On a different note, I initially cut out 200 paper templates. 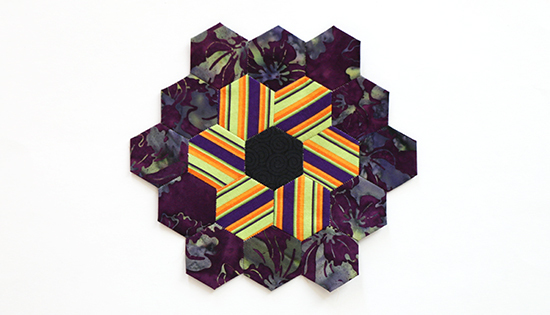 For EPP, the templates are supposed to remain in place until all sides of a piece have been sewn to neighboring pieces, which means that each of my hexagon flower blocks is retaining 12 templates at this point. Based on the number of templates left in my sewing bag, it looks like I’ll run out of them during the coming month. The math bears this out; I should be able to get 16 complete blocks from 200 templates if I remove 12 from circulation with each block. I’m also noticing wear on the card stock templates that have been used more than once. The needle pokes the surface of each template as I baste. 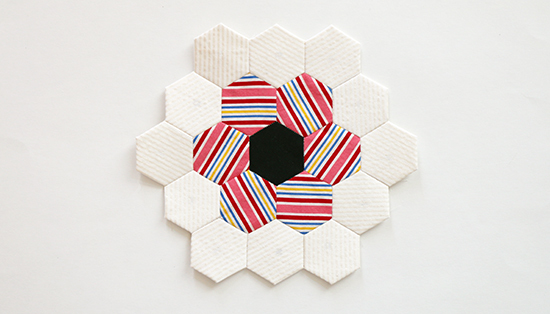 When I sew the blocks together, the edges of the templates are also poked by the needle, and the inner hexies for each flower block develop creases as I fold them to align the outer pieces for stitching. It’s only a matter of time until some of the templates lose their shape or stability and need to be replaced. 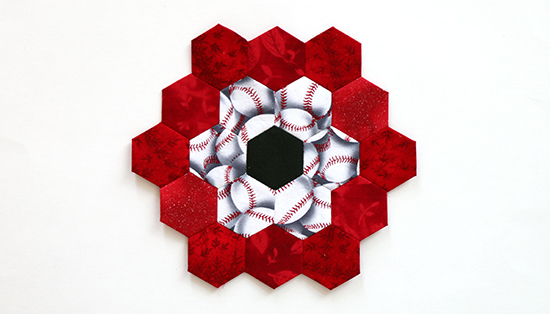 Regardless of the reason, it's time to cut more card stock hexagon templates. Starting with this new batch, I think I’ll mark the templates as I use them to get an idea of how many times I can reuse each one. All of the blocks have a dark center with, relatively speaking, either a light middle ring and a dark outer ring, or a dark middle ring and a light outer ring. 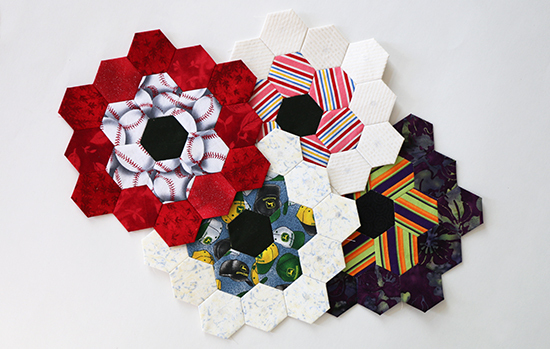 Although I’ve been randomly selecting each pre-grouped set of hexies, to date I’ve made six with a dark outer ring and seven with a light outer ring — right on track for an even balance between lights and darks. I now have 13 completed blocks and, even though I still have quite a way to go, I’m starting to give more thought to how I’m going to bring them all together. Look for another update on The Hexagon Project in about four weeks.